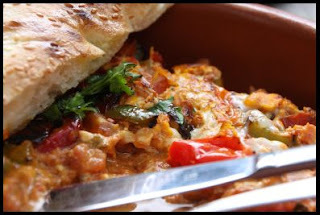 Simon recently noticed someone on Twitter who had been to and enjoyed Tasca on Dominion Road in Mount Eden. So a couple of weeks back we decided we'd give it a go for a change of brunch location (90% of the time we go to Jaffa - because it's always so good and so welcoming). Well, we went, we enjoyed, and yesterday we went again, and again we enjoyed, and again, we intend to return! The first time we went I had the Istanbul Street Pizza - I have incredibly fond memories of my visit to Turkey in 1999 and regularly choose items on menus that I hope will re-intensify those memories for me. It was delicious! Totally different format to what I had in Istanbul, but the flavours - oh! Fantastic! Simon had the Moorish Eggs the first time - a speciality of the cafe - and they were decidedly delicious and I have to order them myself sometime! Yesterday, I had another house specialty - the Piperada - eggs with capsicum, tomato, coriander and served in a terracotta dish, the name for which I cannot remember. Came with a serve of Turkish bread - and was very filling and very very delicious. Highly recommended if you're looking for a healthy, low fat, filling breakfast too. Simon went with something a little more traditional - Eggs Benedict with Smoked salmon. Also served on Turkish bread. He liked it. He thought the hollandaise was definitely home made, perhaps lacked a little lemon, and that the salmon was good and the egg yolks a beautiful colour. Coffees were both really good - we had our usual breakfast choice of trim lattes. And I had a lovely time with my camera photographing the convolvulus and various aspects of the beautiful, secret little courtyard. Actually, it's not that little, but it is most certainly secret and beautiful!